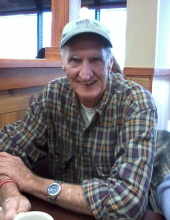 Charles Dennis McClatchey, 75, formerly of Williamsburg, most recently living in Fulton, passed away on Sunday, March 24, 2019. He was born on November 19, 1943 in Callaway County, Missouri, the son of the late Boyd and Marie (Watson) McClatchey. On September 3, 1966, Charlie married Theresa (Gardner) McClatchey. She preceded him in death on January 5, 2001, after 36 years of marriage. Charlie was a graduate of Fulton High School. He worked for Procter & Gamble in Detroit, Michigan where he met his wife. He also worked as a mechanic in Missouri. Charlie retired from Merten’s Construction Company in 1990. Following retirement, Charlie started cutting hay for local farmers. He was well known for his knowledge of the mechanics of tractors, trucks, cars, and heavy machinery. Charlie loved to fish the river and Mark Twain Lake with nets. He would catch and cook fish for the Williamsburg Community Fish Fry. He hosted fish frys for his friends and family for many years. He and Theresa loved to take their camper and travel to State Fairs around the Mid-West. They enjoyed trips to Branson and took a cross-country trip to visit family. Charlie lived life on his terms. He was a simple man who loved his children, grandchildren, and friends. Those remaining to cherish his memory include son, David McClatchey (Beth) of Millersburg; daughter, Lisa Mitchell (Sterling) of Fulton; brother, B. J. McClatchey (Shirley) of Columbia; six grandchildren, Casey McClatchey, Melanie Sowards, Marlee Sowards, MacKenzie Sowards, Malachi Sowards (Libby), and Scott Mitchell (Brittney); great-grandchildren, Abbigail Mitchell, Derrick Mitchell, and Alexzander Mitchell; and many nieces and nephews. In addition to his parents and wife, he was preceded in death by sister, Jean Kosky. A memorial service will be held at 12:00 p.m. on Saturday, March 30, 2019 at Maupin Funeral Home in Fulton with Pastor Kevin Wilkerson officiating. Friends will be received from 10:00 a.m. until the time of service at the funeral home. Inurnment will be in Williamsburg Cemetery. Memorial donations are suggested to Maupin Funeral Home for Charlie’s family, 301 Douglas Boulevard, Fulton, MO 65251. To send flowers or a remembrance gift to the family of Charles Dennis McClatchey, please visit our Tribute Store. "Email Address" would like to share the life celebration of Charles Dennis McClatchey. Click on the "link" to go to share a favorite memory or leave a condolence message for the family.